You are here: Home / BLOG / Uncategorized / I’ve got worms. Actual worms. I’ve got worms. Actual worms. I get occasional back-talk from people who think that “silk caterpillars” would be more accurate… typically they’re about twelve years old and learning about phylogeny, but sometimes they’re know-it-all forty-somethings. Now, I have *real* worms; they live in a bin in the bathroom attached to my studio/office, and they eat our vegetable garbage. I got the starter worm bin from Vicki at Grand Prairie Worm Farm. She was great, answered my myriad of tedious questions, and even delivered the bin. There are lots of different DIY versions, as well as commercial versions, but this was local, and came with great support, and wasn’t very expensive. It came to $44 with local delivery, and that’s not much more than what a pound of worms in the mail costs from most places. These aren’t the worms you can dig up in the back yard – they’re a special composting worm, which doesn’t need deep earth tunnels to be happy like a nightcrawler does. 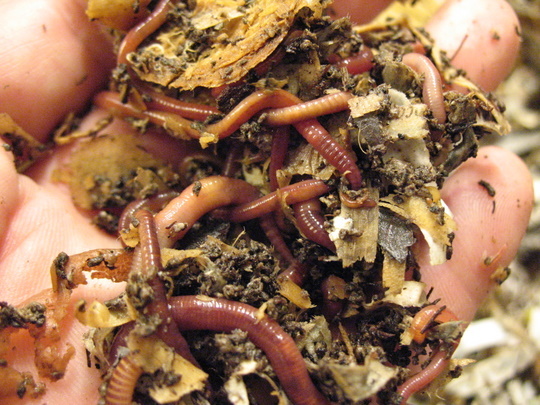 These are red wigglers or manure compost worms – Eisenia foetida. Because they do well in a moist but not wet environment and can eat a variety of organic matter, they do great in a bin. We feed them every couple of days – the cut-off ends of peppers and squashes, the peels of apples, jicama, avocado… you get the picture. They don’t care much for onions or citrus, so those go to the outside compost. The main charm of the worms, is that they produce a superior fertilizer from all this waste. Called worm castings, a lot of gardeners swear they’re even better than manure for nourishing plants. They also chew through waste paper – they’re bedded down in a mix of shredded copier waste and junk mail. 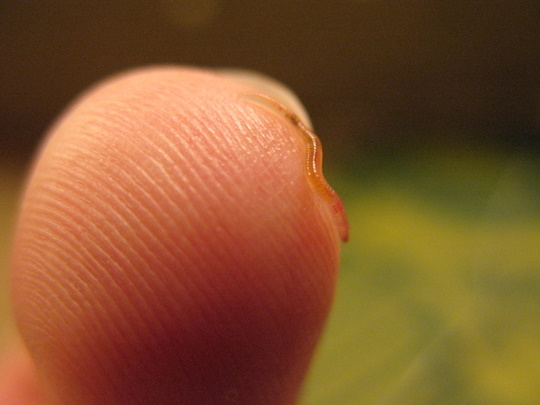 A few days ago, I started noticing TINY worms. Some of them are as small as a quarter of an inch long, and narrower than a piece of sewing thread. And tonight, I found cocoons – the presence of the baby worms means there have been cocoons for a while, I just hadn’t looked hard enough. Many sources have said that other organisms will show up in the bin – and as long as they don’t stink, bite, or crawl out, they’re a good thing, as they help break down organic matter. 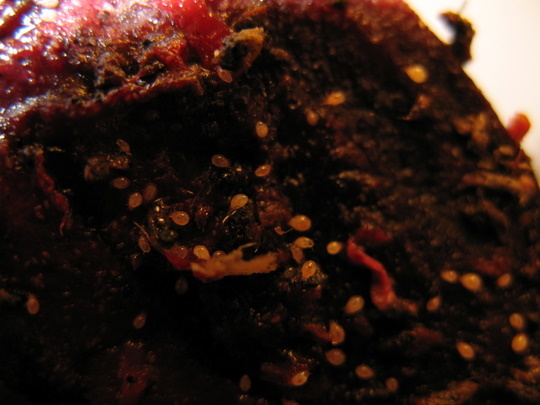 I’m not sure what these tiny things on this beet slice are (insect? other arthropod?) but they’re cool. They look like quarter-size aphids, but they’re a pale off-white. 0 0 Michael Michael2010-03-10 22:46:232010-03-10 22:52:18I've got worms. Actual worms. We’ve had our worm bin for several years. We have lots and lots of other organisms. Mostly little roly-poly bugs, but also some small flying thing like fruit flies (but a bit larger) that get out into the kitchen and have to be caught on fly tape, and a smaller black bug. They mostly stay in the bin, and the ones that do get out are easily caught. I’m sure there’s lots more in there that I don’t even see. They’re pretty fun, and very low-impact as a “pet”; we can leave the bin untended for weeks at a time while traveling. And you get not just worm castings but worm “juice” that drains down through the bins. That stuff kicks a compost pile into high gear. We drain it off monthly and pour it over our outside compost; it’s too much to put it directly on plants (though I sometimes pour it around the base of the fruit trees and that’s done no harm). I had worms for several years – they’re a lot of fun. I learned about the onions the hard way – mass worm exodus! Oooops. The new house doesn’t have a good place to keep a bin that is out of the way and won’t freeze, so I went to just a regular compost pile for a while. And now my town is being all progressive and trying out curbside organic waste collection – I’m in the pilot program. They gave us an indoor bin for food scraps and a larger bin for curbside. It means don’t get to compost myself, but I support what they’re doing so I will participate. 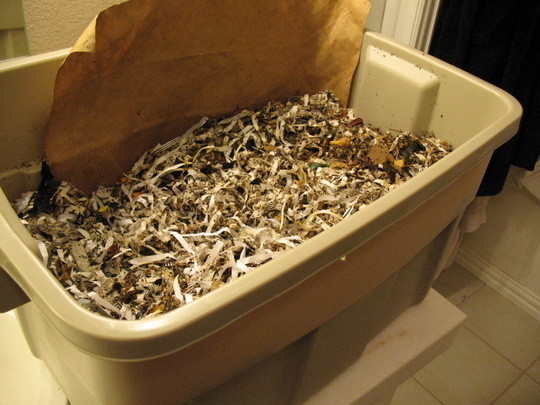 Yard waste still goes in my compost bin.